If it seems as if your marketing and sales teams are playing for opposing sides, you’re not alone. Many organizations lack coordination between marketing and sales, which results in goals and KPIs that aren’t aligned around what matters most – the customer. Marketing generates leads for sales, and then sales development reps qualify these leads to create opportunities that salespeople hopefully turn into revenue. When these teams join forces and create a buying journey that gives value to the buyer at every step, everybody wins, including the customer. It’s time to turn around the traditional way of thinking about sales and marketing. When marketing and sales are aligned around the buyer’s journey and work from a common set of content and buyer insights, the result is a more efficient and effective sales process. Customers are more in control of the buying cycle than they have ever been. They are using the internet to research and consider different options before making a decision. This gives you a huge opportunity to educate and nurture your potential customers and gather engagement insights before leads are passed to the sales team. The nurturing and insights don’t end once sales pick up the ball, however. Here’s where Sales Engagement comes in and empowers sales to provide a customer-centric experience for buyers. Sales start the conversation with a lead based on the information gathered by marketing as well as research into the buyer’s background and social media profiles. But, with sales engagement, the conversation goes further. A Sales Engagement Platform (SEP) helps sales reps take a deeper dive into buyer interest through their interactions. Insights on how the customer is engaging with your content, such as which part of the offer they focused on, which video they watched, what content was shared with colleagues, and whether or not a proposal was downloaded, help sales teams know how to best serve their buyers based on their interests and needs. These real-time insights enable you to adapt and optimize your sales process and provide the most relevant and personalized information possible. When you personalize the buying experience throughout the sales process, you send the message to your buyers that you understand their unique problems and that you provide customized solutions that meet their needs. It takes the combined effort of sales and marketing to produce an engaging buying process that results in higher sales and increased revenue. A Sales Engagement Platform (SEP) uses integrations with your CRM and sales communication channels to streamline the sales process. Sales process tasks, messaging, and workflows are automated to produce one source of truth about your buyers. Using a sales engagement platform allows sales and marketing to combine their efforts to create a personalized and automated buyer’s journey. Fostering cooperation and coordination between marketing and sales may seem like a difficult task. There are many stakeholders with sometimes competing goals. However, when you position the end-result as a unified buying experience that drives better results, it makes buy-in from stakeholders easier. Regardless of your role – sales operations manager, marketing manager, or project manager – implementation of a sales engagement platform will be smoother if you follow the path we lay out below. We have seen great success using this five-step process to optimize the sales engagement funnel and align the goals of marketing and sales. The first key to setting and achieving sales goals, especially those pertaining to customer engagement, is knowing which internal and external stakeholders should be engaged. Internal stakeholders can include your company’s Sales Director, Sales Operations team, Demand Generation team, and Marketing team. These are key players in helping your sales engagement processes run smoothly. External stakeholders include prospective customers. Knowing their needs, pain points, buying habits, and content interests help frame the buyer’s journey around their interests. Whether you’re looking to update your sales engagement process, improve an existing one or set one up for the first time, auditing and mapping your content as a digital sales playbook is the way to go. This helps organize any internal and external content according to each stage of the sales process, makes the entire content repository extremely accessible, and sheds light on any content that might be missing or out of date. With content mapped to your buyer’s journey, your communications with customers will be smooth and productive. It is highly beneficial that you work with your marketing team to design your sales content and templates in a way that will help each customer make an informed and satisfactory purchasing decision. Using a sales engagement platform, such as DealHub, ensures the entire team uses the same templates and the best use cases at all times. When sales engagement processes are correctly employed, the buyer’s journey becomes the top priority. Acknowledge the buyer’s concerns, validating them while proving why the company’s offering is the ideal solution. Businesses should utilize insights derived from data gathered about the sales process to challenge, support and guide customers throughout the stages of the sales funnel. A sales cadence is of the essence, though rigid adherence to it is not. An investment in analytics can successfully position companies as customer-centric, leading to substantial boosts in sales and revenues. Now it’s time to apply your sales engagement solution. 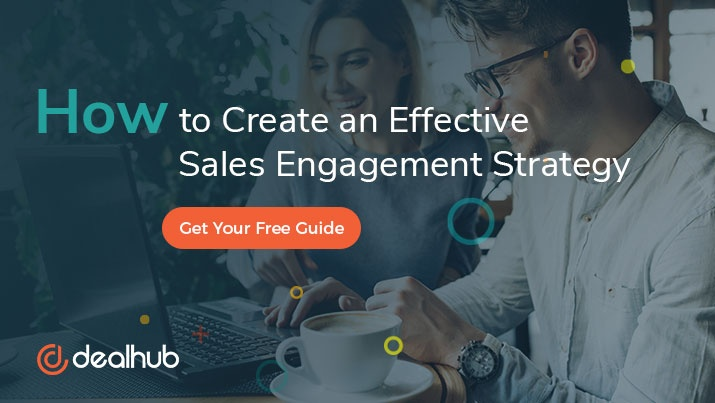 Align your sales team members and enable them to access and utilize a sales engagement platform so they can consistently and seamlessly engage with prospective customers, and start meeting their sales goals. Thanks to your SEP, measuring your performance metrics is simple and painless. Harness this knowledge to optimize your practices, reassess and modify sales process goals and better serve your customers. There is great power in numbers (analyzed data), but only if you use them to adjust and optimize your sales process to better meet your buyers’ needs and your sales team’s goals. DealHub is the platform that enables sales teams to create a personalized buying experience that helps build buyer trust and, ultimately close more deals. Your DealHub will provide the data you need to move deals forward. Aligning sales and marketing through a unified platform creates a clear view of buyer engagement. Every part of your deal process is now connected without blind-spots; enabling you to deliver a deal proposal that aligns with both buyer expectations and needs. A sales engagement platform not only benefits your sales operations process, it also helps meet your customer’s needs for information along the buying journey while making a purchasing decision. It enables sales teams to spend less time searching for relevant content and wasting time on ineffective email communication and follow-up. Marketing gains visibility for the content they have produced and derives insight into the ROI of their content creation. Related article: What is a Sales Engagement Platform? DealHub understands what successful sales teams need to succeed in a highly competitive marketplace. Our Sales Engagement Platform is intuitive to use and is the next step in the evolution of your optimized sales process. How can an effective sales engagement strategy impact your sales process KPIs? Download our free guide to learn how this innovative sales solution helps close more deals!